​Oakland is like that ex who just won't accept it's over. Despite putting out a statement all but assuring his allegiance to the NFL over Major League Baseball and the Athletics, Oakland is reportedly determined to wait for​ Kyler Murray, however long that might take. From the A's perspective, all Murray's statement means is he will not be attending the team's Spring Training, which isn't much of a loss for Oakland. Had Murray remained dedicated to baseball, he'd be starting in the minor leagues anyway. 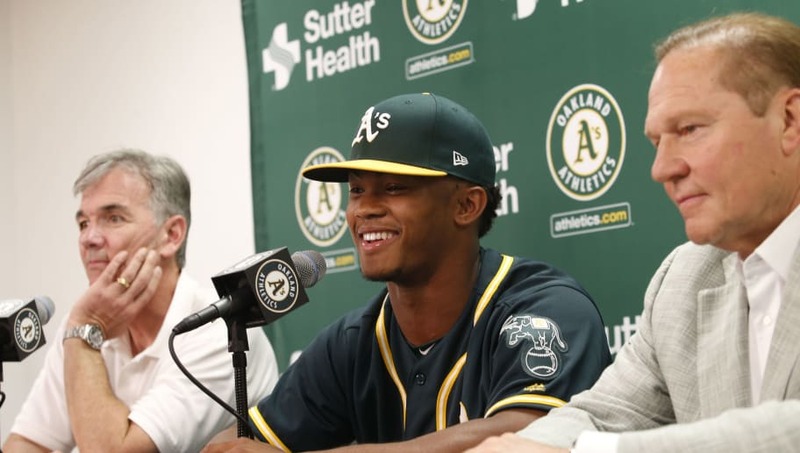 By holding ​Kyler to his contract and forcing him to pay back the majority of his signing bonus, the A's still hold his rights and received a small financial boost. It's a win-win. However, their reluctance to give up on Murray altogether has deeper roots. The A's can no long receive a compensatory pick for Murray given the fact he was offered and signed a contract. By leaving for football, Murray has ruined any chance the A's might have at retaining similar value for their once-prized outfield prospect. Should Murray slip in the draft, Ken Rosenthal says the A's believe they'd have an outside chance at convincing him to return to the organization. If Murray is taken in the first-round, specifically near the top of the draft, however, it'll be much tougher to sway him due to the guaranteed money involved. In the 2018 NFL Draft, the No. 1 pick (Baker Mayfield) received $32.7 million guaranteed while the No. 10 pick (Josh Rosen, ironically) was given $17.6 million in assured money. Oakland can't beat that, period.